Are you in the market for a high-octane cleanup tool? Then gas-powered leaf blowers are perfect for you. With three styles of gale force leaf & debris blowing capability, you're sure to find a leaf blower that matches your needs. The size of your cleanups will dictate which style to go with, either handheld, backpack or walk-behind. If you're looking for a more powerful, yet still small and easy to operate machine, consider a gas-powered leaf blower. They are heavier than their electric counterparts, yet only tip the scales at around 15 pounds so they don't require too much effort to use. Gas-powered, hand-held leaf blowers have more power, blowing air at speeds of around 150-200 mph. Because the engines are gasoline powered, they're louder than electric models. Gas-powered leaf blowers include a recoil start so you'll pull a cord to fire them up. If you're looking for the power of a gas-powered leaf blower, but don't want the strain of a hand-held model, then a gasoline powered backpack leaf blower is for you. With one of these bad boys strapped to your back, you'll be enjoying your clean and uncluttered lawn in no time. Only weighing between 15-20 pounds, these backpack leaf blowers won't physically exhaust you. If you find yourself repeatedly saying, "It needs more power," then a walk-behind leaf blower is the perfect choice for you. You'll need to push these around, but their power is unmatched. Walk-behind leaf blowers are louder than the other options, but they can move more leaves than any of the other leaf blower styles. These are popular with landscaping crews who need to blow grass clippings or leaves away from sidewalks and fences. 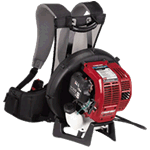 Gas Leaf Blower Buying Guide.. Our Power Equipment Direct how-to library can help you learn about Shindaiwa Leaf Blowers, Proposition 65 Product Labeling and Sales Tax Information.